Before I made my way to the Panhandle stage, I stopped by 4505 Meats for what they were touting as the “Best Damn Cheeseburger” with special sauce, gruyere, lettuce, tomato, and onion. While picking red onions off anything takes away a few “best damn” points for me, the burger was medium rare and damn good otherwise. Best? I’m not sure. But basically, you had me at gruyere & didn’t disappoint. Capital Cities’ Ryan Merchant. Thanks to photog Carl Pocket for this pic! Capital Cities wasted no time getting the crowd with “Kangaroo Court,” whose lyrics create an instant earworm with “shut up, shut up, shut up.” If you don’t know it, you’ll just have to trust me. “What’s up, San Francisco? We’re Capital Cities and we wanna dance with you! You guys wanna dance with us? We’re gonna teach you a dance called the Capital Cities Shuffle…” frontman Ryan Merchant announced. 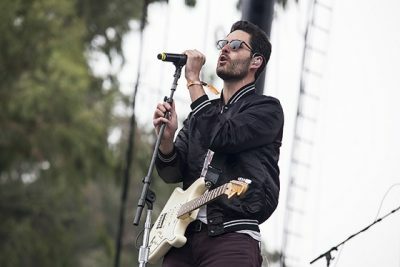 For Merchant, at least, the festival was a bit of a homecoming; though the band is based out of L.A., Merchant is a homegrown San Franciscan who was excited to play for such a crowd. After a fun cover of the BeeGees’ “Stayin’ Alive” (with a little bit of Weezer’s “Come Undone (the Sweater Song)” thrown in for good measure) came “I Sold My Bed, But Not My Stereo,” fantastic new song “One Minute More,” and finally, megahit “Safe & Sound.” During the latter, the crowd was asked to take part in a Capital Cities tradition: to take off any scarf, sweater, or similarly removable item of clothing and wave it around while dancing. It was quite a sight to behold as tens of thousands of people jumped, danced, and waved things in the air to end a great set. Before the headliner, I chose a chocolate brownie hot fudge sundae from nearby Leslie’s Dessert Werks. The fudge was amazing, I’m a sucker for whipped cream out of a can (no sarcasm intended), and the chocolate ice cream was dreamy. The brownie, however, left something to be desired and as such, went largely wasted. Oh well. It still satisfied me all the same, hitting the sweet tooth right where it counts. While the music was energetic and full of brilliant nostalgia, it was Petty’s seemingly genuine sense of humility and appreciation for the wonderful crowd that struck me again and again. Great bands may be a dime a dozen, but for me this is one of those missing pieces that really makes me love one band more than the next: sincerity is clutch. “Whoa, baby, thank you so much!” Petty gushed near the end of the set. “We’re runnin’ outta time, we gotta play you one more!” The band’s final set was, he said, one they’d first played “so long ago at this place called the Keystone in Palo Alto, reaching all the way back to nineteen seventy-siiiiiiiix…” The song was “American Girl,” and of course the crowd devoured it, singing along at the top of its lungs. It was an iconic moment with an iconic band, and while I’m sad I had to skip Macklemore & Ryan Lewis to see it, I know I made the right choice. As Petty & the Heartbreakers bowed, blowing kisses and waving to the crowd, Tom himself bade a final goodbye to the audience, saying, “thank you so much, have a great weekend. God bless you, good night!” A class act, that Petty.